When two parties conduct a negotiation, they must be willing to make concessions to achieve a mutually acceptable deal, or face the consequences of no agreement. Therefore, negotiators normally make larger concessions as the deadline is closing in. Many time-based concession strategies have already been proposed, but they are typically heuristic in nature, and therefore, it is still unclear what is the right way to concede toward the opponent. Our aim is to construct optimal concession strategies against specific classes of acceptance strategies. We apply sequential decision techniques to find analytical solutions that optimize the expected utility of the bidder, given certain strategy sets of the opponent. Our solutions turn out to significantly outperform current state of the art approaches in terms of obtained utility. 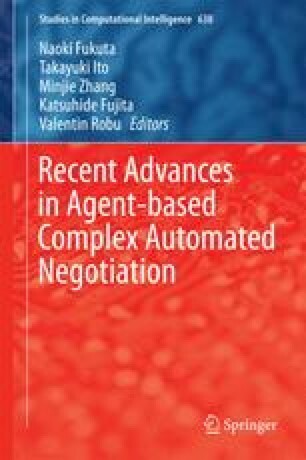 Our results open the way for a new and general concession strategy that can be combined with various existing learning and accepting techniques to yield a fully-fledged negotiation strategy for the alternating offers setting.